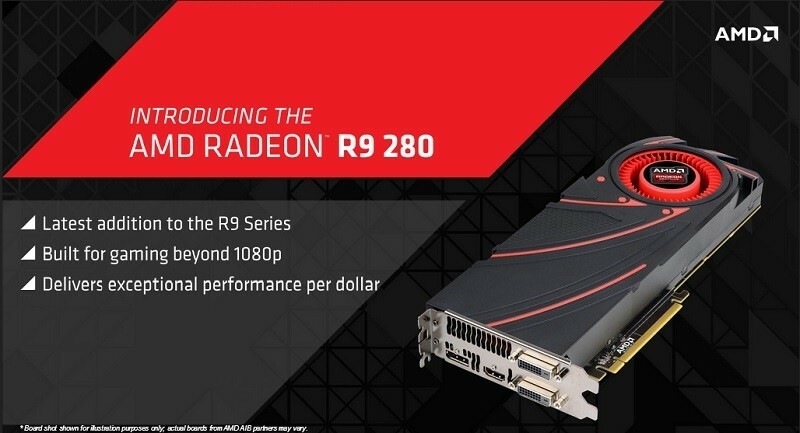 The Radeon R9 280 will retail at $279, which is an interesting price point at the moment for the card. Cryptocurrency miners have pushed the price of the R9 270X up to $279 at some retailers, so there's a chance the R9 280 will immediately go on sale for higher than AMD's MSRP to fit into the inflated pricing structure. Meanwhile the R9 280X price currently sits between $399 and $499 at most retailers, again thanks to miners. Specification wise we're looking at a Radeon HD 7950 Boost with a minor overlock of sorts, raising the boost clock from 925 MHz to 933 MHz. This shouldn't have a huge impact on performance, but it has meant AMD has raised the "Typical Board Power" up to 250W from what was around 225W. All other R9 280 specs are identical to the 7950 Boost, which makes it slot nicely between the R9 270X and R9 280X. AMD claims the Radeon R9 280 should perform better than its nearest competitor, the $249 Nvidia GeForce GTX 760, in a number of situations. That said it does presently cost $30 more, and if prices end up inflating, we could see it priced against the much more powerful GTX 770, which currently sits at $329. The Radeon R9 280 will become available this week, with wider availability expected for next week. As this card is a simple re-brand of the HD 7950 Boost, we won't be reviewing it, but if you're interested in how it might perform, check out some of our past reviews for the HD 7950 and GTX 760.